What happens to people who aren't good enough at mining to survive in lowsec? alazarr3 lost a blingy Retriever in a 0.3 security system. Deciding that she wasn't cut out for a life of danger, alazarr3 retired to highsec. ...Where she was promptly ganked. Highsec can be dangerous, too--if you disobey the Code. What alazarr3 really needed was a mining permit. Now we introduce our plot twist: alazarr3 had already made arrangements with the New Order. Or had she? The miner sent a complaint letter to another Agent, Aiko Danuja. But things didn't stop there. 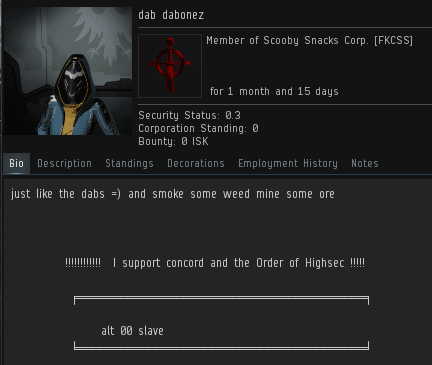 One of alazarr3's corpmates, dab dabonez, also claimed to have been punished despite owning a permit. 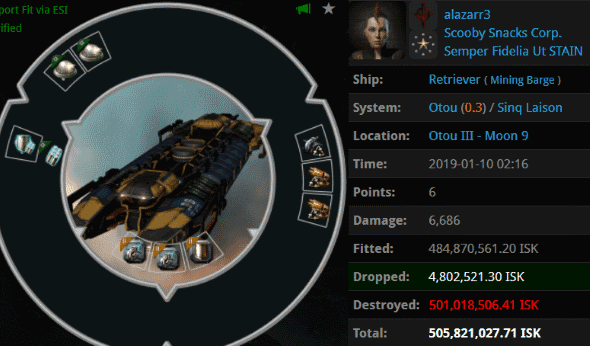 He didn't lose his ship, but a quarter billion isk worth of blingy mining drones had been confiscated. The situation was escalating rapidly. The New Order prides itself on its just, fair treatment of all those who own mining permits. Our Agents have a solid reputation--and the record to back it up. But now there was a case of multiple miners claiming that their permits weren't being honoured. A scandal of unprecedented scope was developing. A special Blue Ribbon investigation was launched into the matter. Immediately it turned up red flags. dab dabonez's bio bragged about mining while intoxicated, which is strictly forbidden under the Code. The corporation that both miners belonged to was also sketchy. Agent Drugs McFarland credibly testified that one of the miners was using illegal drones--which was corroborated by dab's admission that he'd lost a quarter billion in drones. Though the complaints continued to roll in, the crisis seemed to have passed. These were guilty, bot-aspirant miners. Their permits had been voided. 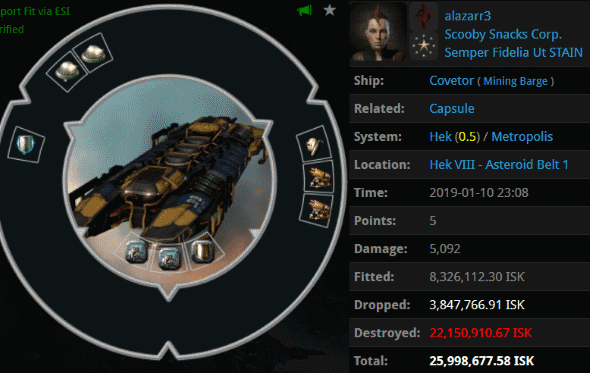 alazzar threatened to spend 87 billion isk on mercenaries to wardec the mighty CODE. alliance. That wasn't something a Code-compliant miner would say. No, these were the words of a Goofus. And we all know what happens to Goofuses, don't we? Agents Alt 00, Drugs McFarland, and Princess Aiko are some of the best players and the most upright citizens of High Sec anyone could ever meet. I'm glad their names were cleared from this viscous anti-ganking plot of lies and deceit. As a point of future reference in cases yet judged by you, has CODE ever been found responsible for violating an established license holder and been ordered to repay constitution? Has the fact that so many license holders are disciplined by agents reflect an error in your educational programs or merely show that most license holders are not too intelligent? Does CODE offer legal aid in cases to ensure fair trial? Look forward to your next post; always a fun read! I don't speak for James, but as an enforcer of His will I can say that all permit holders are more intelligent than the smartest High Sec miner. The New Order educational system uses the finest curriculum from the Lawton School for Pubbies Who Can't Mine Good. It is the best school system in High Sec, far better than that diploma mill ghetto school at Eve-U. When miners purchase a permit they promise to obey the Code. If they don't follow the Code then their permit is automatically revoked, an agent doesn't even have to be present or even aware of the revocation. Permit holders that get ganked by our agents are in violation of the Code. This is a learning opportunity for the miner and a chance to "fail forward". 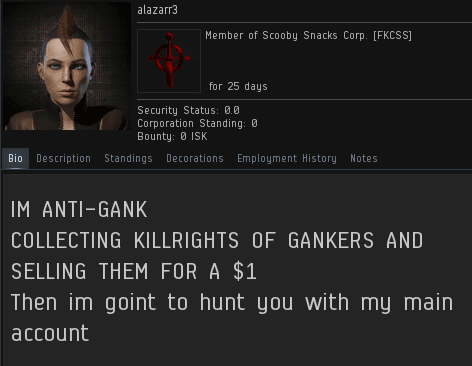 I recently ganked a permit holder who was afk (and therefore in violation of the Code). We tried him in a court of his peers, and he plead guilty. He gave us a GF and then apologized for violating the Code and promised to do better. A real gallant in the making. All miners already have an advocate fighting on their behalf before, during, and after these trials, it is the New Order agent. Nobody cares more about miners than we do. My question for you Mr. Anon, have you read the Code? Have you purchased your mining permit? Thanks for the vote of confidence Anon 7:27. Yes, at the LSFPWCMG we don't teach to the test. We ensure our pupils are thoroughly grounded in the fundamentals, with the necessary practical experience to appreciate that mining in highsec is a terrible idea. Miners, they still think it is about a pay off when purchasing a permit. These are the same people who purchase items at ikea and dont need to read the instructions and wonder why the table collapsed while eating dinner. Just follow the CODE. And stop with seeking attention. The only law this miner broke was the one that says "Never talk to CODE in game." No talking would mean no content for you. Operation Ssssssshhhhh Code... was it a success? Nobody knows. You couldn't tell anyone about it. Maybe their toons used sign language. If you don't talk about it you'll never improve. Plus all that anger will build up inside from failing non-stop daily. "'The mighty CODE. alliance only wants attention. If everyone ignores them, they'll get bored and go away.' Such was the thinking of the bot-aspirant carebears... in 2012." Don't say CODE, just spell it out C O D E then they won't know you are talking about them. Must be miners, only a miner uses pubbie terms like toon. Go back to wow and claim insurance pleb. After taking the life of a miner, I typically enter a period of several weeks where I quietly reflect on the moral, ethical, metaphysical, and spiritual implications of my actions. Killing a permit holder is like losing a beloved pet - a member of the family. It is reassuring to read these words of encouragement, following what has been a difficult and emotional time. Sure I'm happy to post here, but I'm not going to talk to you in game. Honestly I find the whole "Praise James" religious angle pretty off-putting. You'd be much better off embracing your pirate nature instead of pretending to be a religion. What are you, some kind of godless Atheist? In case it's not clear, there were two drone incidents. First he lost the drones, then McFarland went and found him with new drones. 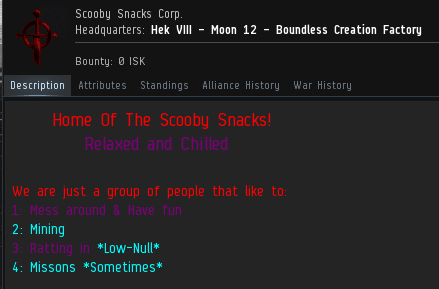 So he lost two sets of drones within 24 hours, plus a half billion isk retriever. Such a senseless waste of invaluable mining permits is painful to look at.